The “Household Nutrition Security in CARICOM” (FaN) project recently met with newly designated “Policy Entrepreneur”, Dr. the Hon. Christopher Tufton, Jamaica’s Minister of Health and has agreed to collaborate with the Ministry on Jamaica Moves initiatives. 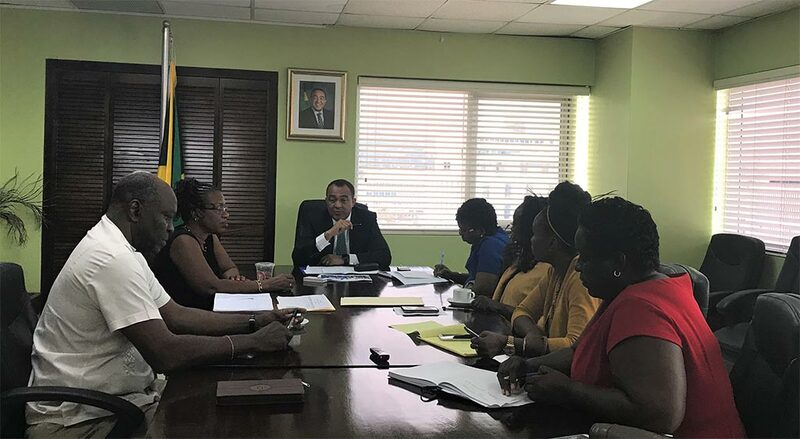 During the meeting, Minister Tufton and his team commended the IDRC funded FaN Project team and graciously accepted the designation as a “policy entrepreneur” with a view to promoting what is best for children in Jamaican schools. Principal Investigator, Prof. T. Alafia Samuels, revealed that the project will be assisting the Ministry of Health with the healthy eating component of Jamaica Moves in schools. “This will be achieved through the development of options for healthy, delicious menus including the use of local, green bananas and eggs. To achieve this, we will be working closely with Nutrition Products Limited and the Ministry of Education to lead the evaluation of the meals currently being offered in urban and rural primary and secondary schools, by examining the sugar, sodium and trans-fat contents being offered by canteens and vendors at the school gates,” Prof. Samuels said. The surveys will be repeated after the new nutrition standards are initiated to investigate if there was a change in consumption. The next steps will be for the ministries of Health and Education to finalize the Nutrition Policy before it goes to Cabinet for approval. The two groups also discussed the suggested Front of Package Labelling being developed by the CARICOM Regional Organisation for Standards and Quality (CROSQ), as well as logistics of pending laboratory upgrades to allow for the testing of foods for sugar, salt and fat levels in foods.